The new Superman and Batman figures will be on display at the Mezco Toyz booth at the New York International Toy Fair beginning on February 13th and industry insiders have already proclaimed The One:12 Collective to be a "Game Changer." 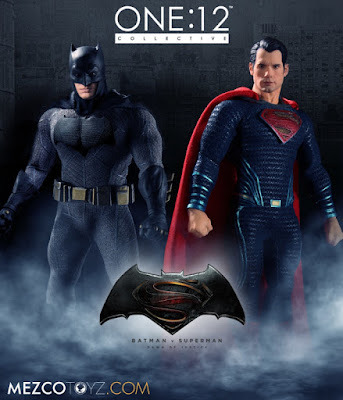 The One:12 Collective elevates the action-figure collecting experience with hyper-articulation, durable construction, authentic likeness, precisely tailored costuming and a ton of meticulously designed accessories to create an incredibly interactive product that displays beautifully. Combined with characters from some of the world's most high profile pop culture brands, The One:12 Collective is crafting the next generation of collectables. Although Toy Fair is not open to the public, Mezco Toyz will have images available of their products on their Facebook page www.facebook.com/MezcoToyz as well as on other social media and their official website MezcoToyz.com.